Pumpkin is a traditional part of the autumn harvest in North America. In autumn many companies produce seasonal pumpkin-flavored desserts, beverages, and other foods. Pumpkin cheesecake is one of them. It even has its own holiday celebrated on October 21, the National Pumpkin Cheesecake Day. Cheesecake is a dessert that typically consists of at least two layers: a pie crust and a thick layer made of cream cheese, eggs, and sugar. Cheesecake can be prepared in many flavors, and pumpkin is one of them. 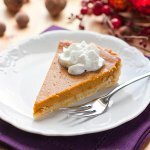 Pumpkin cheesecake is often made for Halloween, Thanksgiving, and Christmas. To celebrate the National Pumpkin Cheesecake Day, treat yourself to a slice of delicious dessert that you can pick at your favorite local bakery or cook yourself. Here is an easy pumpkin-flavored cheesecake recipe. In a bowl, combine 1 3/4 cups graham cracker crumbs, 3 tbs light brown sugar, and 1/2 tsp cinnamon. Add 1 stick melter salted butter and press down flat into a 9-inch springform pan. Beat 3 (8 ounce) packages softened cream cheese until smooth. Add 1 (15 ounce) can pumpkin puree, 3 eggs, 1 egg yolk, 1 1/2 cups sugar, 1/4 cup sour cream, 1/2 tsp ground cinnamon, 1/8 tsp ground nutmeg. Mix well and add 2 tbs all-purpose flour and 1 tsp vanilla extract. Beat together until combined. Pour filling into crust, spread out evenly and bake for 1 hour at 350 °F. Put into the fridge for 4 hours before serving.